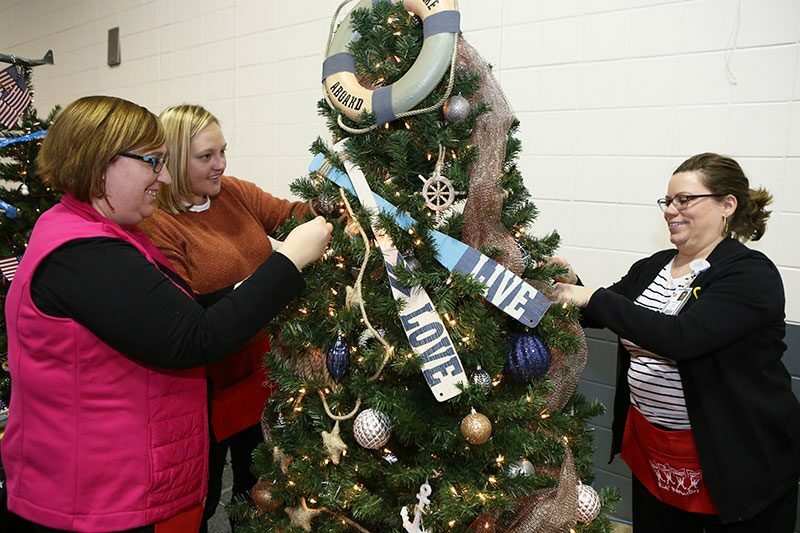 (left-right) Sara Lundenberger, Joni Fitch and Nicci Avalon decorate their tree for the 35th annual Holiday Tree Festival in memory of their friend and co-worker, Jody Smith. For the past 35 years, the Holiday Tree Festival has offered people a creative way to bring their interests and passions to life. It’s also become a way for people to honor the memory of someone who made an impact in their life. For Nicci Avalon, Joni Fitch and Sara Lundenberger, the person they came together to remember at this year’s Holiday Tree Festival was their coworker and friend, Jody Smith. “Jody had a true love for kids and would do anything to make kids happy, and I think the Holiday Tree Festival did that,” Nicci said, Children’s Miracle Network Hospitals program manager at Akron Children’s Hospital. Jody was a long-time contractor for Akron Children’s, working with Children’s Miracle Network Hospitals, and she loved decorating trees for the Holiday Tree Festival. Together with Nicci, she had decorated a tree for the festival every year since 2008 – some years more than one tree. “We’ve done a lot of trees together and I think the fun part for Jody was bantering with Sara while they decorated, then getting dressed up and attending the Preview Gala to see the finished product,” Nicci said. After Jody passed away unexpectedly this past April, Nicci, Joni and Sara decided that decorating a tree in her memory would be a fitting tribute. They decided on a lake theme to also pay tribute to Jody’s love for her life on the Portage Lakes. Lakeside Memories will be on display with more than 140 other trees at this year’s Holiday Tree Festival. You can visit the festival for free at the John S. Knight Center from Nov. 19-27. For more information, click here.